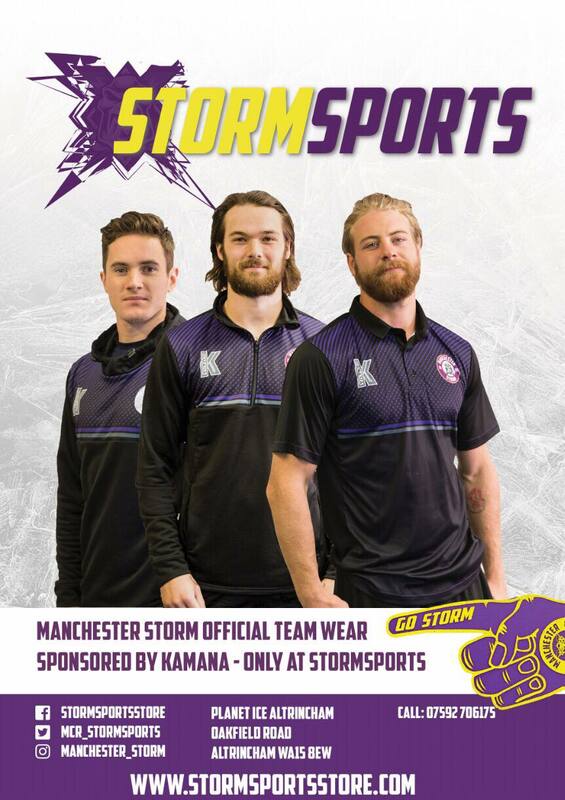 With just nine home games left in the Manchester Storm 2018/19 season, the team are pushing towards playoffs. 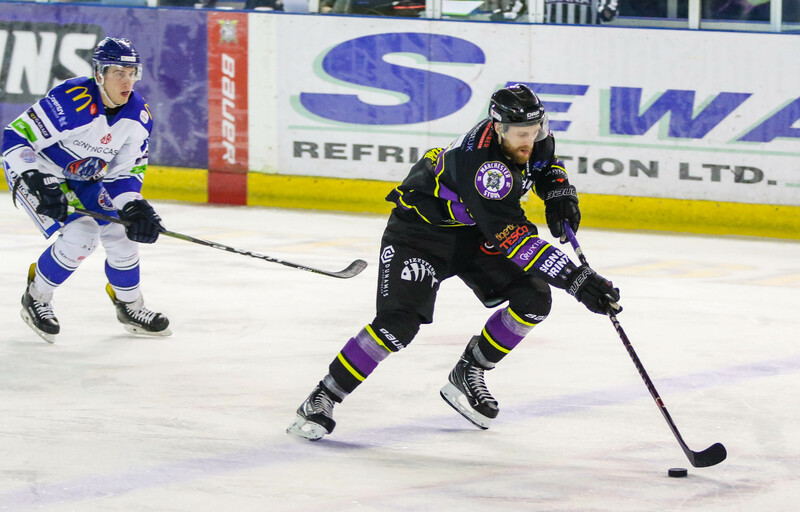 They are currently on an eleven point streak on home ice, and will be looking to continue this weekend against visitors, Sheffield Steelers. The Storm were first in the penalty box, as Springer was called for Interference at 4:08. Despite being a man down, it was Storm who drew first blood when Long scored a top shelf goal on a short-handed breakaway, Hammond with the assist at 5:39. The second penalty of the evening arrived at 12:58, Bryhnisveen for interference. Storm rushed forward and scored goal number two, tipped in by Byers on the powerplay and the assists from Ehrhardt and Hammond at 14:22. At 18:22, Springer was handed a two minute penalty for slashing. Blaze took every opportunity they had, Pauly scoring on the powerplay, assisted by Morris and Venus at 18:51. Storm came out strong in the offensive zone, getting shots in early. 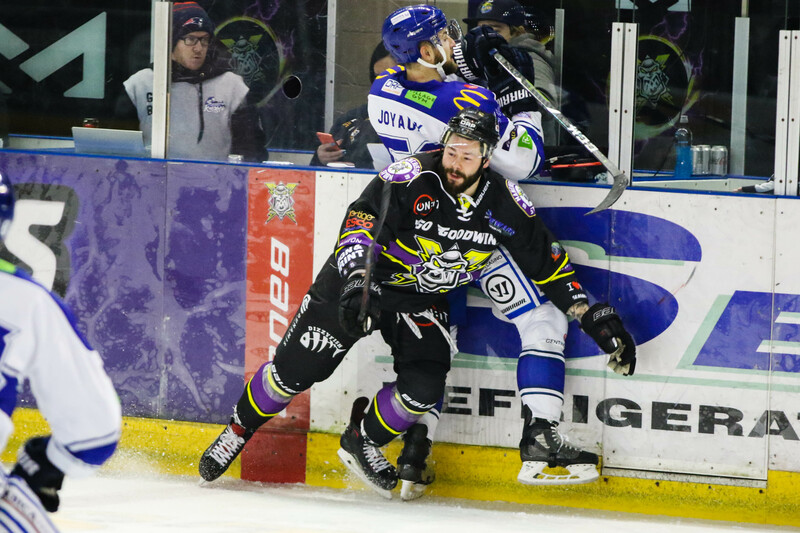 Despite this, Blaze found their equaliser goal on a two on one play. Goal number two was scored by Crowder and assisted by Lake and Hache at 21:40. They took their chances aiming to up the scoreline moments later, but Ginn gloved any incoming shots. Lake was handed a two minute penalty for hooking at 27:05, resulting in Storm claiming their third goal of the night. Ehrhardt scored the powerplay goal, assisted by Moffatt and Long at 27:22. Blaze found goal number three five minutes later, equalising at 32:39. it was Flodqvist who found the equaliser, assisted by Puzic and Nikiforuk. Momentum picked up, as both teams fought for an extra goal – forty minutes passed but the scoreline remained 3-3. Both teams came out fighting in the final 20 minutes of regular time, aiming for goal four. At 44:0, Morris was handed a penalty for tripping, and Lake for high-sticking at 55:47. This was the opportune moment Storm needed to get that extra goal. Any chances for a powerplay goal fizzled, as Long then received a penalty for high-sticking at 58:28. 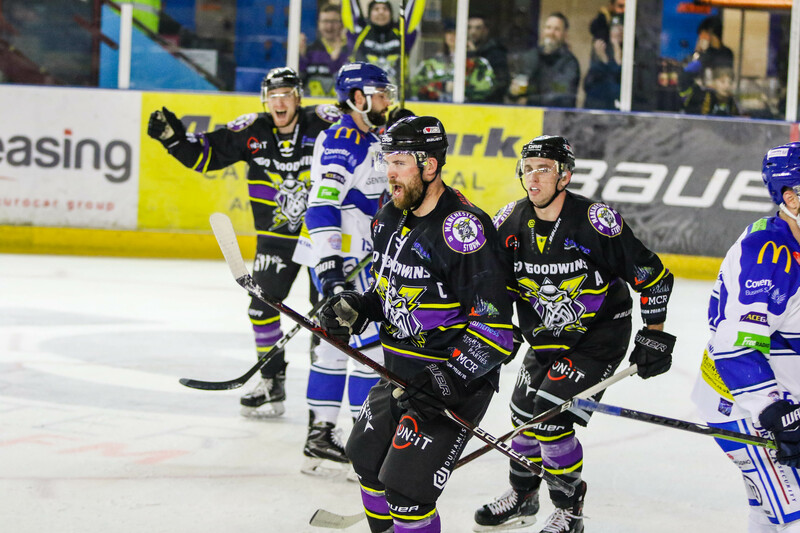 With no team managing to score on a four on four opportunity, or Blaze on the powerplay, the final buzzer sounded and the game went into overtime. Starting overtime was Auger, Ehrhardt and Springer. Blaze had an extra man on the ice for a short period, due to Long’s penalty in the third period. Stadel was handed a penalty for high-sticking at 61:24, giving Blaze the advantage. It was Nikiforuk who scored the winning powerplay goal at 62:58, Bryhnisveen and Flodqvist getting assists. Duly noted was Matt Ginn, who made save after save during the final few minutes of the third period and into overtime during penalty kills. Despite the 4-3 loss, Storm continue their point streak at home and look to continue this weekend. Man of the Match for Coventry Blaze went to #22, Nikiforuk. Man of the Match for Manchester Storm went to #1 Matt Ginn. 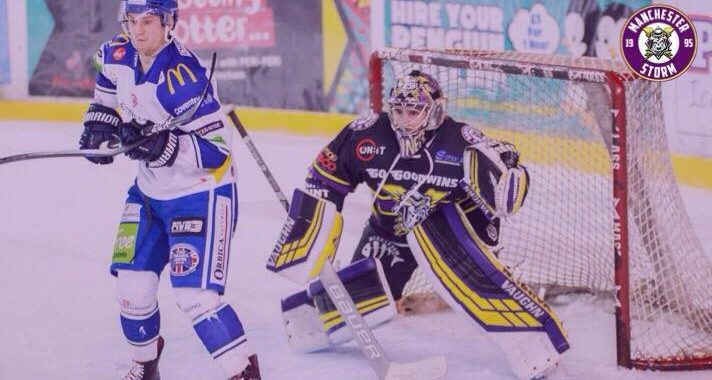 The Storm’s next home game is against visitors, The Sheffield Steelers – 27th January, 17:30PM face-off! There is the opportunity to meet the players post-game in Jack’s Bar for some signature and photos. The OSC’s next event takes place January 22nd, 19:00PM. Email [email protected] for more information! The supporters club have a few upcoming events, including their first ever “Ladies Night,” which is to be held at Tiger Tiger Manchester.